Sen. Mark Warner, the top Democrat on the Senate's intelligence committee, said the panel "intends to ask" Trump Jr. why he took the meeting. The top Democrat on the Senate Select Committee on Intelligence says he "absolutely" wants to hear from Donald Trump Jr.
Sen. Mark Warner told reporters Monday his committee is interested in learning Trump Jr.'s account of a meeting he attended with a Russian lawyer who has ties to the Kremlin. 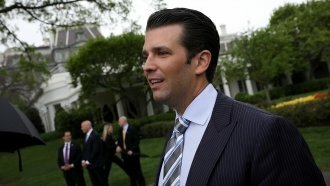 The New York Times reported over the weekend that President Donald Trump's eldest son met with a Russian lawyer in June of last year. The attorney promised Trump Jr. "damaging information" about his father's presidential opponent, Hillary Clinton. Trump's then-campaign chairman Paul Manafort and Jared Kushner, Trump's son-in-law, were also at the meeting, according to the Times. Kushner is now a White House senior adviser. Warner said the committee "intends to ask" Trump Jr. and anyone else who was in the meeting "some very serious questions about why they'd take this meeting." In a series of tweets Monday evening, Warner said news of the meeting "follows a constant and troubling pattern ... [of Trump officials] conveniently forgetting about [meetings] with Russians." Trump Jr. tweeted that he'd be "happy to work with the committee to pass on what I know." Reuters was first to report that Trump Jr. has hired a criminal defense attorney. In an off-camera briefing Monday, Principal Deputy Press Secretary Sarah Huckabee Sanders said it was her understanding that President Trump found out about the meeting "in the last couple of days." She also said she "would certainly say" the president's eldest son "did not collude with anybody to influence the election." Sanders told reporters: "As I know many of you receive similar calls of people offering information. Don Jr. took a very short meeting from which there was absolutely no follow-up." She stood by past statements denying there was any collusion between the Trump campaign and Russia. "I think the point is — that we've tried to make every single time, today and then, and will continue to make in those statements — is that there was simply no collusion that they keep trying to create that there was," Sanders told reporters.